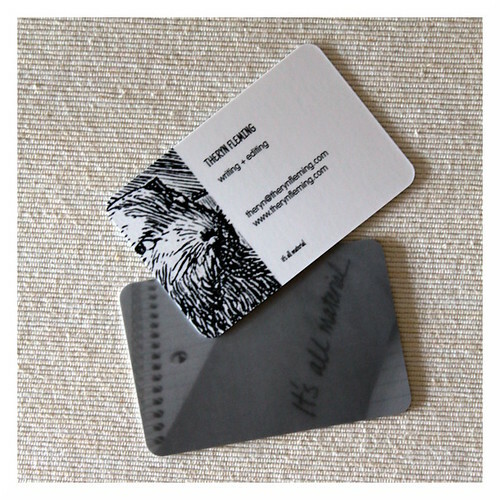 As a step toward one of my 2014 goals, I ordered some business cards from Moo. They arrived yesterday, two weeks exactly after I ordered them. Much faster than the estimated arrival date of January 28 (bet they do that so you’re all impressed when they arrive “early” 😉 ). As I was figuring out what to put on them, I realized that I have approximately a zillion food photos and almost none of writerly things like notebooks and pens and laptops. So there’s a goal for 2014: take more photos of writerly things. In the end, after much futzing, I went with one simple design that incorporates a version of my cover image on the front and the Hunting of the Snark beaver on the back (what else?!). This entry was posted in Editing, Writing and tagged Moo on January 16, 2014 by Theryn.